Our first ever Wobby Special: for Stripdagen Haarlem we made a special edition in collaboration with Kapitaal Utrecht. 22 artists created new work about 'De Kelder' / ‘The Cellar’. 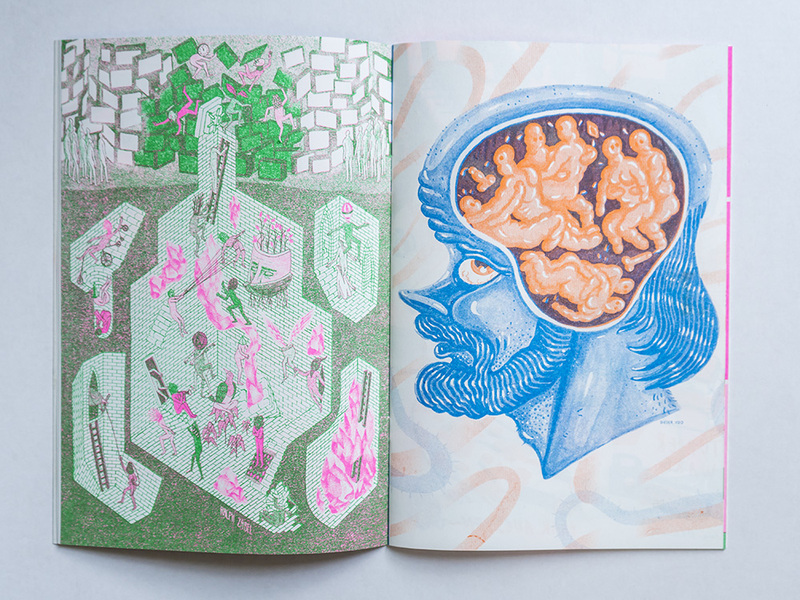 Risograph printed by Kapitaal Utrecht (Orange and Blue) and Wobby.club (Pink and Green). This issue was launched at comic festival Stripdagen Haarlem 2015. Cover by Bobbi Oskam. Jeroen de Leijer, Marjolein Schalk, Steppie Lloyd Trumpstein, Mike Diana, Jeroen Funke, Jip Piet, Wayne Horse, Seb Ikso, Levi Jacobs, Maia Matches, Moedars, Sam Peeters, Marcel Ruijters, Bart Schoofs, Eva Stalinski, Anne Stalinski, Dieter VDO, Gees Voorhees, Wasco, Isa van Weert and Ralph Zabel.